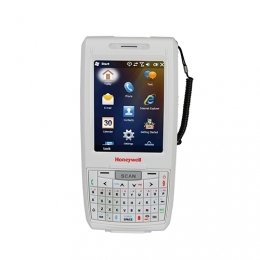 Patient information, test results and stock quantities - these are always at hand and easy to capture with the Honeywell Dolphin 7800hc. Its integrated 802.11 a/b/g/n Wi-Fi technology allows for reliable data and voice exchange within the entire facility. Thanks to its high performance battery, the Dolphin 7800hc gives users its all, even way after a normal shift finishes up to 12 hours of continuous operation are possible. The IP64-certified housing of the Dolphin 7800hc is specially suited for the healthcare sector. Its white surface makes for easy daily cleanings with harsh cleansers - an absolute must for hardware in this demanding area. The IP64-certified magnesium interior and hard plastic casing ensure for the required robustness. Additionally, the terminal easily withstands drops from heights up to 1.5 m and remains fully operational within the generous temperature range of -10 to 50C. The integrated 800 MHz processor, 256 MB RAM and 512 MB Flash leave enough leeway for professional applications. The 8.9 cm 3.5 VGA touch display impresses with its crisp readability, and allows you to comfortably operate it with either your finger or a stylus.